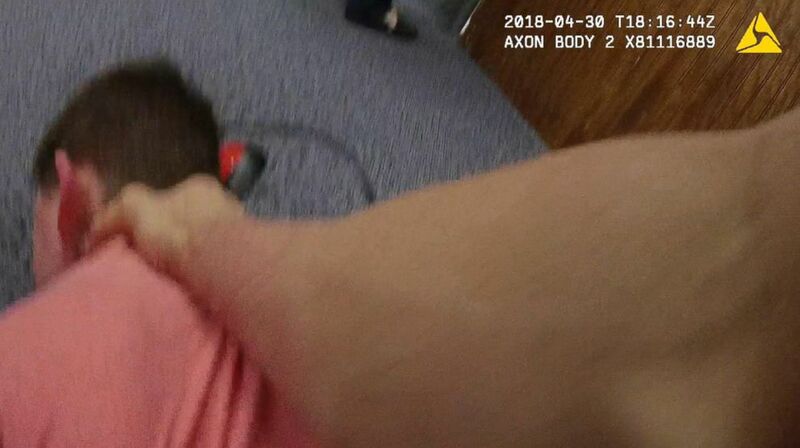 In the events captured by the officer's body camera -- the footage was shared with ABC News and parts of which were corroborated with police reports -- the child, Thomas, appears to try to isolate himself in a cubbyhole when he saw a teacher moving toward him. Eric Coulston, a Denton Police Department school resource officer, then stepped forward to help after the teacher pulled Thomas out of the cubbyhole, according to a police report. Coulston carried Thomas to a vacant room, as he kicked, screamed and struggled to get away, according to the footage. "Do you want the handcuffs? Or not?" Coulston asked in the room, according to the video footage, holding the boy face-down on the ground by his neck, as Thomas continued to struggle. Coulston then pulled the boy's arms behind his back and placed the handcuffs on the boy's wrists, adding, "We're back to where we were the other day." Bodycam footage of a child with autism seemingly being held down and handcuffed was released this week. "Wanna kick some more?" Coulston said. "Get off," Thomas said repeatedly screaming as he sobbed. Over the next two hours, Thomas was placed in restraints once more, held down by his neck for long periods of time, and allowed to sit up without the handcuffs when calm, according to a police report. 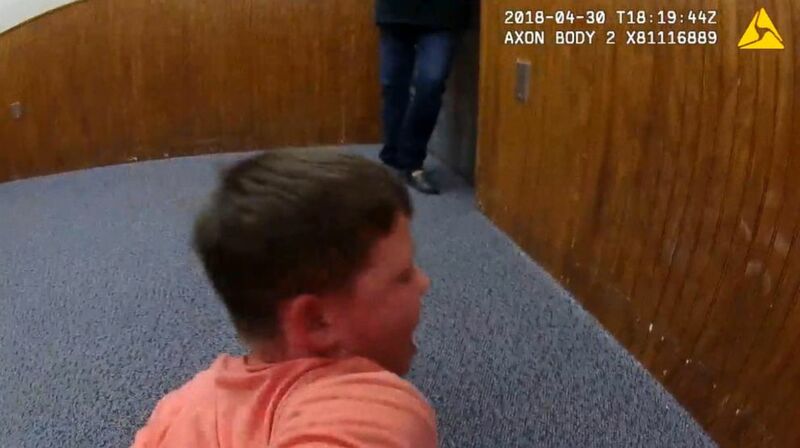 The second time he's placed in handcuffs was when he began to tear up tissues into small pieces and threw them in the direction of his teacher, the report says, adding that another time he slid himself towards the door before he was dragged back to the other end of the room and held down by his arms. "It's abuse, the torture, and the hell that he was put through," Emily Brown, Thomas' mother, told ABC affiliate WFAA in Dallas of the April 30 incident. The parents say it was only when they noticed Thomas had severe bruises on his body that they suspected he had been subjected to what they believed was an excessive use of force. Thomas' parents said they had a detailed behavior intervention plan in place with the school, which listed a set of de-escalation techniques for when he became agitated. Nowhere in that list, they said, was the use of restraints or holding him down to the ground with force permitted. "It was abusive. It was excessive. It was vicious. It was calculated," said Michael Holum, an advocate consultant representing the parents of the boy, Emily and Robert Brown. 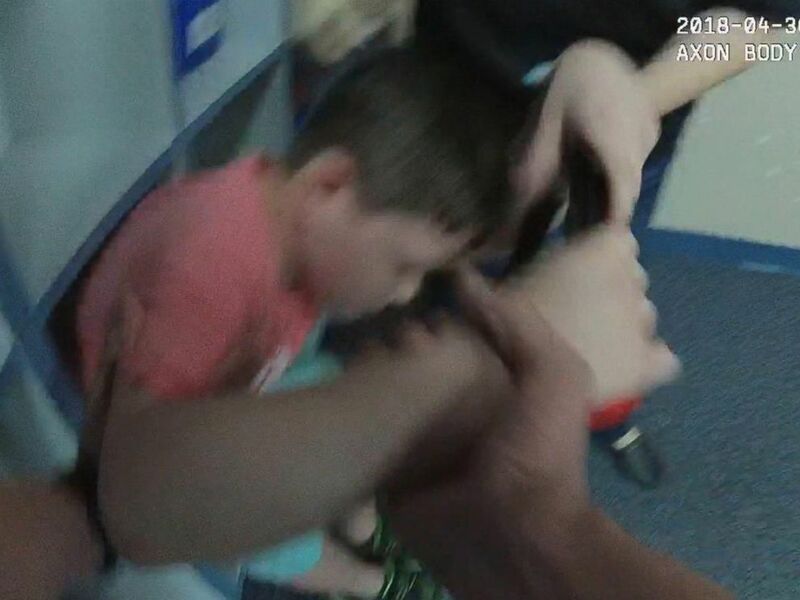 What irks the parents most, Holum, who heads the Texas-based Advocacy Behavior Consulting, told ABC News, was that there did not appear to be any serious or imminent danger to the school authorities, himself or others when Thomas was placed in handcuffs. "If he's being put in handcuffs just because of a tissue, that's outrageous," he said. "I do this professionally in over 50 districts. This is the worst I have ever seen and there's no close second." Holum said on April 23, a few days before the events took place in the video, Emily Brown walked in on her son in handcuffs. Police say they will release footage from that separate incident to the Browns on Wednesday, but if events in that video of April 23 are similar, Holum said it will show a pattern of behavior on the part of authorities in their treatment of Thomas. On April 23, Emily Brown found her son restrained in handcuffs at the school, things were calm and Thomas was sitting quietly in handcuffs, according to Holum. At the time, the mom didn't realize what the authorities may have done before handcuffing the child -- possibly holding him down and using excessive force, Holum said. She also took what they said at face value, Holum added, which was that Thomas was harming others and disrupting the classroom. It was only when the Browns saw the bruises on Thomas from the second incident on April 30, Holum said, that they began to suspect something was wrong and asked for the footage. When the parents received the footage on Tuesday, Holum said, Emily Brown was horrified and broke down in tears. "The parents believe that both agencies, Denton Police and the Denton Independent School District, in and through their employees, participated in the events captured on the body-cam video," Holum said. "They are seeking action, civil or criminal, that will keep these particular public employees from ever being able to be near children with disabilities again." The Browns are interviewing attorneys for their suit. In a written summary by the Denton Independent School District, Thomas was described as engaging in self-harming behaviors and that he engaged in "physically assaultive and unsafe behaviors." "SRO Coulston deemed handcuffs appropriate a second time in order to minimize the student's ability to harm himself or engage in acts of violence against others," according to the report. The Denton Police Department Office of Professional Standards initiated a review of the incident and no violations were found, a statement by the City of Denton said. Coulston is still employed as a school resource officer at a middle school in the school district. He did not immediately respond to ABC News’ direct requests for comment. The Browns, meanwhile, said they "vehemently disagree" with the findings that there was no violation of policy or laws. The parents said they want an independent investigative agency, either from the state or the federal government, to conduct an investigation. "We as parents will never stop fighting for our son," a statement from the parents said, "or other children, so that they can be safe within the walls of their school and free of physical, emotional and psychological [abuse] at the hands of the very people that are publicly employed to protect them."